Update: Our Pixie Williams: The Voice of Blue Smoke display is now open and will be available to view during opening hours on Central’s first floor for the next three-four weeks. A cabinet guide is available here. On Monday September 16 at 10.30 am, Wellington Central Library will be opening a special display celebrating the life of Pixie Williams. 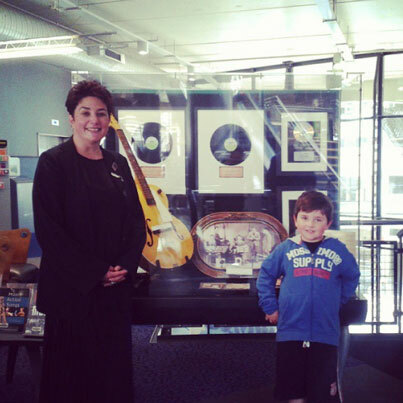 Come to the library to join in the opening and view photographs, instruments, albums and taonga belonging to Pixie. Also available for review will be Chris Bourke’s book The Lost Dawn of NZ Popular Music 1918-1964 which details the story of the making of ‘Blue Smoke’. 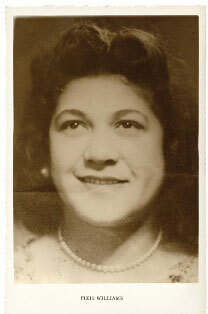 In 1949, aged 21, Pixie Williams gave voice to one of the most enduring popular melodies of the twentieth century – ‘Blue Smoke’. Originally released in early 1949, ‘Blue Smoke’ was arguably New Zealand’s first pop song – the first song wholly written, produced and recorded in New Zealand. It was also a huge hit topping the New Zealand chart for six weeks and selling 50,000 copies. It was played on radio stations and juke boxes around the world and covered by a host of international artists, including Dean Martin. ‘Blue Smoke’ was one of 13 songs recorded by Williams between 1949 – 1951. Born Pikiteora Maude Emily Gertrude Edith Williams (Pixie) on July 12, 1928 in Mohaka, near Gisborne, Williams was raised by her beloved grandparents and enjoyed a happy and musical upbringing until the age of 12, when her grandmother died. As her grandfather had died in 1934, she was taken into the care of her uncle and was required to do a lot of hard, physical work on his farm while keeping up with her school work. At age 14, her natural mother returned to collect her, after relatives expressed concern at how hard she was being worked. However, not much changed for Williams and she was still worked hard, but managed to save a bit of money and decided to get some singing lessons, because she loved to sing and ‘wanted to do it right’. At the age of 17, she escaped to ‘the big smoke’ (Wellington) and got a factory job. Pleased to have left ‘home’, she vowed never to return. Pixie moved into the YWCA Hostel on Oriental Parade. Her roommate, Joan Chittleburgh, heard her extraordinary singing voice as Pixie always sang in the shower and at hostel piano sessions every Sunday evening. ‘Blue Smoke’ was one of the songs in Pixie’s repertoire. Through Joan, Pixie’s talents came to the attention of composer Ruru Karaitiana (whom Joan later married), who was looking for a singer to bring his song to life. 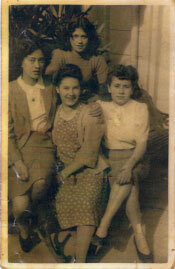 Pixie Williams (top) with friends, 1949, YWCA, Wellington. 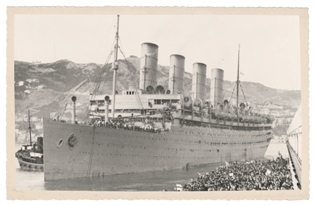 Karaitiana wrote ‘Blue Smoke’ in 1940 on board the troopship S.S Aquitania, off the coast of Africa. A member of the 28th Maori Battalion Concert Party, it was sung in the desert between battles and became popular at troop concerts and at home long before it was recorded. Evoking the emotion and sadness of parting loved ones heading to war, the song appealed to post-war sentiments. S.S Aquitania in Wellington Harbour, c1940. Karaitiana’s ‘Blue Smoke’ launched Williams’ career. It was a magical collaboration between artists that nearly didn’t happen. Williams twice turned down Karaitiana when he asked her to record his song. Two months after first asking, she finally agreed – on the condition that the recording didn’t interfere with her Saturday hockey games. Recorded at Radio Corporation’s newly built Columbus Recording Studio at 262 Wakefield Street, the recording was a true DIY production. Recording engineer Stan Dallas, who built the Studio, experimented to get the best sound and came up with the idea to connect the electric guitar direct to the recording equipment instead of using a microphone – a practice that became the way recording studios worked internationally. And lap-steel guitarist Jim Carter went to night school to learn radio technology and made his own five-watt amplifier for the recording. With no sound-proofing in the studio, or editing capability available (as artists are used to today), ‘takes’ had to be perfect from start to finish. The strain on Williams ‘unprofessional’ voice, and the musicians, took a toll. It took an agonising nine days to capture over 5 weekends. 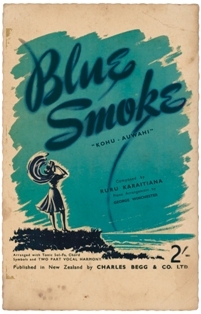 ‘Blue Smoke’ was the first of Karaitiana’s compositions to be recorded. It was the first song ever recorded by Williams and the first release for newly formed label TANZA (To Assist NZ Artists). It was also New Zealand’s first wholly written, produced and commercially recorded song. Pixie went on to record 12 other songs between 1949 – 1951 with ‘Let’s Talk it Over’ being another hit selling 20,000 records. Humbled by the attention her recordings were causing, and always the reluctant star, Williams left Wellington for the South Island for a working holiday, ending in Dunedin. Karaitiana had made the move to Dunedin in 1950, and they reunited for concerts at Dunedin’s His Majesty Theatre. Karaitiana had also penned two more songs which Williams’ recorded at the studios of 4YA Radio Station – ‘Saddle Hill’ (about a famous Dunedin landmark) and ‘It’s Just Because’, written in honour of the troops of K-Force departing for the Korean War. Williams didn’t return from her holiday and while there she met the man she would marry, Irishman John (Paddy) Costello – with whom she had four children. She had successfully slipped quietly from the limelight. 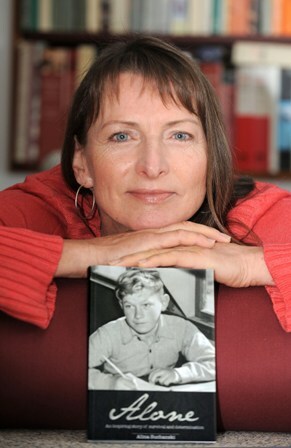 After the death of her husband in 2006, and diagnosed with dementia, Williams returned to Wellington to live with her son. At this time, a special project was undertaken by Williams’ daughter, to capture all of her mother’s recordings in one collection for release while she was still alive. Williams’ family hadn’t heard of the majority of their mother’s recordings so the project was one of discovery, and the chance to capture her music and story for future generations. Recorded onto brittle 78 Shellac discs, finding the whole collection was the first obstacle. This was made possible by family friend and ’scratchy records’ collector, George Boraman, who had started collecting Williams’ recordings in 1970. When hearing of the project, he was missing one record and, once found, he presented the full collection to Williams’ daughter for remastering. With no background in the music or recording industry, Williams’ daughter turned to another family friend. Tim Fraser agreed to produce the collection. He sought the services of Mike Gibson, mastering engineer from Munki Mastering, for the arduous task of re-mastering the recordings, and Marcus Wilson, an audio expert to capture the definition and detail that was so difficult to capture. This ended up being another great DIY project reminiscent of the original recording of ‘Blue Smoke’. On her 83rd birthday on July 12, 2011, ‘For the Record – The Pixie Williams Collection 1949-1951’ was released. Williams’ was wheelchair bound at this stage but well enough to attend the launch and 63 years after the first recording, was honored with a Triple Platinum award for ‘Blue Smoke’ and a Single Platinum Award for ‘Let’s Talk it Over’ from RIANZ. For Williams, her recording career was very much for the love of it. Like many musicians who recorded with her, she was never paid for her work. She couldn’t read music but taught herself to play guitar, ukulele, the banjo and piano accordion. At age 73, she decided to teach herself the organ – for something to do. On 2 August, 2013 she passed away peacefully, after a long battle with Parkinson’s disease, diabetes and dementia. The popularity and poignancy of Blue Smoke followed her down the years with TANZA’s first ever recording outlasting the music genre’s that followed. In 1990 Blue Smoke was used in Jane Campion’s ‘An Angel at my Table’, a film adaptation of Janet Frame’s renowned three-part autobiography. Film-maker Gaylene Preston used Blue Smoke to close her movie ‘Ruby and Rata’ released in 1998. In 2001, 52 years after it was recorded, to celebrate the 75th anniversary of the Australian Performing Rights Association (APRA) in New Zealand APRA members and an invited group of experts voted Blue Smoke No. 17 of New Zealand’s top 30 songs. In 2006 Blue Smoke was used in Robert Sarkies film ‘Out of the Blue’. In 2009, on the 60 year anniversary of the song, The Wellington International Ukulele Orchestra released their upbeat version of the song giving it the full ukulele treatment in a special single-disc release also available online. In 2010 kiwi Shelley Hirini released her version of the song which was recorded in Nashville, USA and has a distinct country sound. Early this year Shelley Mac (nee Hirini) in association with Blue Smoke Records and Williams’ daughter, released her tribute album to Pixie Williams titled ‘Do You Remember’. Recorded in New Orleans, USA (to capture that very special jazz and blues sound that Karaitiana and Williams so loved), and in Wellington, New Zealand with Dr Lee Prebble, thankfully Williams got to hear it, and give it her blessing, weeks before she passed away. Blue smoke : the lost dawn of New Zealand popular music, 1918-1964 / Chris Bourke. All information and photos included in this post is used with permission from Blue Smoke Records.